"Out of the Caldera: Making Creativity Happen"
"Talking Back to Homer: Women Poets Re-write the Odyssey"
"'In the Feminine Vocative': Circe's Epic Magie"
"Theories of Everything: Multi-genre Workshops, Multi-Genre Writers"
"Why Prose Writers Should Make Poems"
"Tell It Like It Isn't: the Fine Art of Fiction & Other Lies"
"What is an Appalachian Poet?" "Writing Women in Tang China: Lives, Lies, & Poetry"
"Writers-in-Residence or Institutional Lackeys? : A Panel on Academe"
"Yogis, Gurus, Nuns, & Transcendentalists: Adventures in the New Age"
"Inscriptions of the Body in Poems by Tang Courtesans"
"Women of the [Qing Dynasty] Imperial Household"
"Engendering Narratives: Historical Novels as Examination of Gender Constructs"
"Tying Loveknots: Female Desire & ecriture feminine in Poems by Women of the Six Dynasties"
"Women of Religion in Tang Poetry"
"Text & Matrix: Dickinson, H.D., & Woman's Voice"
"Translating the Lives & Works of Chinese Women"
I'm a multi-genre writer, because really, each way of making things with words has its particular pleasures. I translate poems because I owe so much to other translators, other poets. When I was eight or nine, I decided that someday I'd write magical books; I'd already produced at least one bad poem back then. When I discovered (by accident, as a means to travel) that I mightily enjoy teaching, my path was clear. On to the future: if you're planning a writers' conference, or looking for someone to visit your university, book club, or some other group, I might be the one. 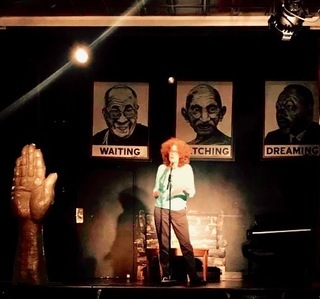 I enjoy doing poetry and fiction readings, lectures, classroom visits, workshops, and writer's talks, and have visited many campuses as well as book clubs, high schools, coffeehouses, libraries, and bookstores. My poetry, fiction, and creative nonfiction have been fed, deliciously, by my education (the undergrad degree in the study of religions, the master's in creative writing, the Ph.D. in comparative literature, the language study in Taiwan and Japan as well as the U.S.). My interest in Buddhism dawned when I was in high school (in Germany, as it happened) and got serious a few years later; I still struggle with sloth and busy-tude. I'm grateful for the grants and awards that let me do research travel, and getaways for writing-immersion time (at Byrdcliffe, on Norton Island with the Eastern Frontier Society, Hambidge, the Millay Colony, Ragdale, VCCA). Also, you betcha, for post-doc work at places like UCLA, U. Michigan, the East-West Center of the University of Hawai'i, the Stanford Center in Taipei, and the Center for Hellenic Studies in DC. Heartfelt thanks to all of them and to the NEA, Japan/US Friendship Commission, Virginia Foundation of Independent Colleges, Arts Council of the Blue Ridge, Bread Loaf, the International Association for the Fantastic in the Arts, the American Council of Learned Societies/Mellon Foundation, the Oberlin-Shansi Association, the Academy of American Poets, Hollins University, and a few more. Believe me, you made a difference. These days, I'm happy to be living in Virginia's Roanoke Valley, just west of the Blue Ridge. But I travel as much as I can: growing up as an Army brat will do that to you. My first poem was published in the Virginia Quarterly Review, back when I was living in Nagasaki, Japan. If you want a full list of publications, or other information, please email me via the form on the Contact page.